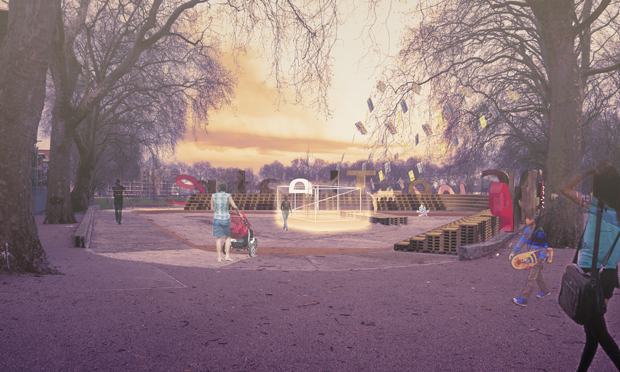 Stoke Newington architect Sarah Akigbogun’s latest project may be small scale, but it aims to provide big fun to the people of Millfields Park. She has set up crowdfunding for a Cine-Theatre, to be made of pallets and recycled materials, that will transform the park’s Old Paddling Pool into an open air cinema and theatre for a day – and maybe beyond. The pop-up event and community build is set for Saturday 10 June, and will be a test run for the concept, which Akigbogun hopes can be replicated at different sites across London. Once the structure is erected by staff and volunteers, there’ll be a day full of storytelling, theatre and workshops – with film screenings set for the evening. Akigbogun, herself an actor and filmmaker, also runs the Appropri8 Theatre – whose slogan ‘No Theatre Required’ tells you what you need to know about their anarchic approach to staging. When asked what drew her to the Millfields site, she replied “it was the amphitheatre-ness really! Donation rewards include limited edition prints and the chance to have your name etched into one of the pallets that form the structure.